The Wife has some time off. I got home after work last night and took this picture. I'm so lucky to have a wife that likes to play along. Before a couple days ago I'd never heard of Mark Bittman. Today I know two things about him. He has a TED Talk and a very short Wikipedia page. I especially hadn't heard of him before I posted my first thoughts on food. But now I have. And I like him. Because as it turns out, he agrees with me...erm, I agree with him. Really, talk about giving up meat, or the best sort of meat, or the best diet...but isn't my current crisis really about over consumption of just plain everything? How about I start with a 2,000 calorie diet and see what sort of effect that has on the amount of meat I consume? Here's Mark - it's 20 minutes so I grilled up a big slab corn fed beef to enjoy while I watched. If you cared enough to give me life advice in food post #1, please - watch this. "What's wrong with what we eat"
...I'll never stop eating animals I'm sure, but I do think for the benefit of everyone, the time has come to stop raising them industrially and stop eating them thoughtlessly." This week we planted peas and beans. Beginning tomorrow I'll warm up my shower by filling a bucket to take outside and pour on the potted cherry tomatos. We fenced the garden and I'm determined to take better care of the tomatos this year. Soon most of the fields this city will fill up with corn. Believe me, I understand the importance of corn. It's similar to the importance of the automobile. I also heard Mark Bittman talk about the family farm. Here's a preview for a new movie, King Corn. It's overexposed - someone's been messing with my camera. I think it was me. I've made adjustments. Well, I have 10 minutes left in this year’s 15 minutes of radio fame. Contrary to what I thought, I know of 1 (one) person that still listens to the radio in their car. If someone had been listening to the radio they would have heard me talk about how grossly inefficient legal bicycling is on the sidewalk. They would have heard a police officer describe the legality of riding on the roadway and the legal way to ride on the sidewalk. The listener would also have heard a logical and reasonable description of the desirability and functionality of the brightly colored shirts and the spandex shorts. DJ Andy seemed genuinely interested and reasonably enlightened to the facts above. I was quite satisfied with the bits that went over the air. I think there was good and factual information in the 5 minutes of air time. To DJ Andy’s credit – he had obviously read both my e-mails, the second was a rather lengthy set of points I think I’m good at discussing. Andy was willing on air, to face his ignorance of bicycling law and his ignorance of bicycling clothing. I commend him for that. To DJ Andy’s dis-credit – he was not willing to face his ignorance that “jokes” like “BUT STILL, I'm driving a 4,000 lb car, you're riding a 10 lb bicycle. Get OUT OF THE STREET” and “I was like - if I had a bee bee gun right now, he would be yelping and calling the cops” are dangerous and irresponsible. Because of this - parts of the meeting were very contentious. By that I mean I was contentious. With home field advantage, a bee bee gun and a 4000 lb car - he was not. If the law says a bicycle has all the rights and responsibilities of any other vehicle on the road and The City installs traffic sensors that don’t detect bicycles, isn’t The City violating the law? The officer got it and immediately called in for the arrest of The City traffic engineer. Just kidding - the officer DID get it, which is enough for me right now. A person driving a bicycle along a crosswalk, shall have all the rights and duties applicable to a pedestrian under the same circumstances, except that a bicyclist must stop before entering a crosswalk from a sidewalk and must yield to all traffic on the highway. The officer believes if the bicycle stops before entering the intersection then any collision within the intersection is the fault of the automobile driver. I strongly suggest “yielding to all traffic” within the intersection makes collisions the bicycle rider’s fault. If you agree with my interpretation you’ll find it interesting that this officer is responsible for teaching bicycle safety to children in the schools. If you disagree with me - you probably haven't read this far anyway. In reality, the only person who really knows what these laws mean is the judge that tries the case. In other words, we'll let the courts decide that. Hopefully the cyclist needing the clarity is alive to hear it. That’s all…unless it’s not all. 3pm Update - It's on. With SFPD. I'm surprised and impressed with my PD. 2pm Update - DJ Andy has postponed to an unspecified date due to a lack of SFPD response to the invite. I recommend tuning in, just in case something changes. I've been practicing my radio voice all day today. If all goes according to plan I will be speaking with DJ Andy on the air at 5pm Drive Time Wednesday. That's Hot 104.7 on your FM radio dial. This seems like a rather rare opportunity to discuss cycling with a frustrated driver. I guess he got a kick out of my e-mail. He was especially appreciative of the lycra covered asses ending. An invite has been issued and conversation occured with a specific officer in the police department. Media appearances need departmental approval. I'll be very surprised if the SFPD participates. Sending an officer into a situation as uncontrolled as this seems nuts to me. If you listen set your expectation dial to low because my late confrontation with a motorist ended with me falling off my bike. If you're reading this you're not riding your bike to work. Why not? I'm trying hard to get my head around a set of posts about food. I've scrapped two or three crummy attempts today. I feel the pressure to post so here. It's what we had for supper Sunday evening. Minute steak from a southeastern South Dakota cow, butchered last fall. Lettuce greens, potatos and radishes from a farm (with a greenhouse) near Madison. Don't see the radishes? They're baked in with the potatos. This season, The MinusCar Household seeks to reduce the distance food travels from ground to stomach. There's a good argument that distance is less a problem than simply eating cows. That's fine...I have a feeling as the season progresses we'll be trying to eat so many vegetables before they rot that red meat consumption will decrease - drastically. More on this later. Probably. "I've learned that the bicycle is the natural enemy of impulse buying. My previous dreams of new cars, large houses, and secluded lots far out in suburbia have morphed into dreams of simple, chemical free living with plenty of time to enjoy life. I've learned that I can live without a dryer, that it's okay to sweat in summer. I've learned to appreciate the chill of winter. I’ve discovered my neighbors and we know each other by name. I’ve learned that I’m not meant to go fast, that going slow gets me there just as quickly. I’ve learned to live more deliberately with less." Forest found his way into the Western Kentucky University newspaper last week. That's where the photo is from. "He rode through a cemetery. He said he loves riding through cemeteries. It always puts things into perspective," he said. Reminds me of the last Snakebite/FAB Scavenger Hunt. The City produced a Bike To Work segment for their "Around Downtown" television program. 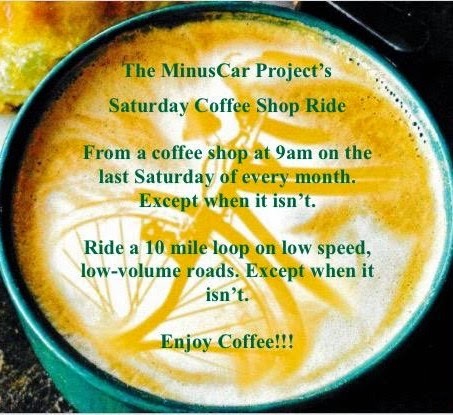 Check it out on the Sioux Falls Bikes To Work blog. Did the weather keep you from riding to work today? The rain was done by the time I departed work but I sure needed to make a lot more eye contact than usual on the way home. If you're reading this I'm glad you made it home too. As promised here's my end of month mileage and gas report. I bought gas on the 10th. Sorry I forgot to record how far that tank took me. I'll catch up on May (or June). If you need your subscription refunded because of this let me know. 3 tanks in four months. ...on 12 Hours In Photos. Hopefully there will be more sets than just mine in the next couple days. 2pm - outside the office supply store to buy printer paper I saw this rare for my town rig. (Hi Jodi!) Yes, our large big box toy store has no webkinz. The mall does, ugh. James Howard Kunstler and Stephen Colbert were on my iPod last night. His book is "World Made By Hand." I generally lack the fortitude to read JHK, but when I do I'm happiest with him when he's travelling the themes this book seems to. Perhaps I'll be enjoying it soon.